Who doesn’t love ninjas? With their stealthy black masks and lighting quick reflexes, it’s hard to resist a cool game with them on especially if it’s offered for free. Take NinJump HD for instance. This stunning and fast paced game puts you in control of this masked, sword wielding hero. Your main task is simple, you just have to climb a wall as high up as you can go. Despite the uncomplicated gameplay, the game is one that’s hard to put down. It was developed by Backflip Studios, a company who seems to have a knack for making even the simplest, most mundane game premises quite addictive. They’re the same geniuses who gave us Paper Toss: World Tour and Ragdoll Blaster 2. As mentioned, NinJump HD is a simple game. 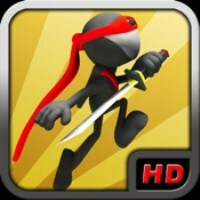 All you have to do is make your ninja jump from one side of the wall to the other while climbing higher and higher. Of course, you’ll encounter obstacles and enemies along the way. From flying killer squirrels to crazy birds that will try to kill you; they won’t make your climb any easier. Bonuses are also in store for your cute ninja but you have to be on your toes when trying to reach them. Graphics for the game are stunning. The music is also quite good, not irritating at all. In fact, it’s a great stimulant as you go about the game. However, the best part for me is the fact that the game has a really good response time. It’s really fast and most of the time, even you’ll be reeling from trying to keep up. Nonetheless, the developers have to make money somehow. In this case they are doing it by selling shields. You can play the game without any purchases no problem, but if you do get sucked in and will think you really want the shields, be careful not to leave too much money behind :). The game has a lot of replay value if you’re the type who likes to beat their personal high score. Openfeint and Gamecenter support is available as well so that’s always something fun. It’s one of those games that’s easy to pick up, get lost in and enjoy without much thought. Give it a go.